Hi! 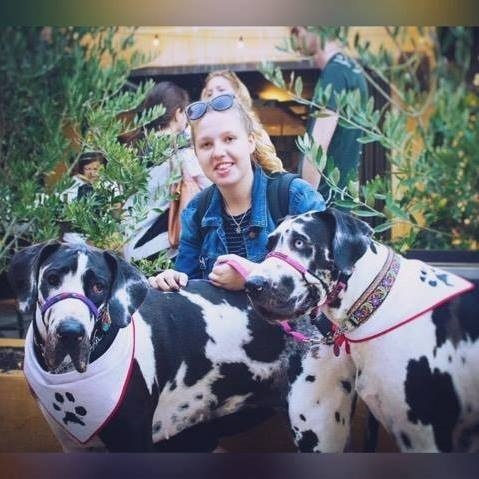 My name is Alex (Aleksandra) and my passion for the Great Dane starts all the way back in Poland and back to the time when I was 4, where I saw my first picture of a Dane - a harlequin. 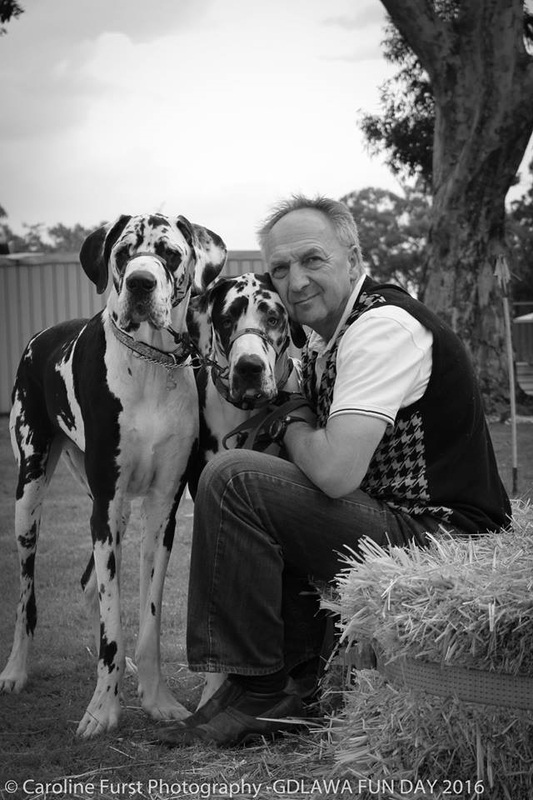 I instantly fell in love with how majestic and powerful these dogs were - I knew that one day, I would own one. And I almost did, having rescued one at a trainstation, but my friend convinced me in to giving him to a lady who would take him to an animal refuge to find his owners instead - he was a Harlequin and the first ever Dane that I met. Getting home, I begged my parents to get me a Dane of my own, however, my parents had other ideas and I ended up owning a Chihuahua named Kuba, who till the tender age of 18, was my shadow. When I was 23 years of age I moved with my husband, Wieslaw, and Martyna to Perth, Australia, where 4 years later, my youngest daughter Caroline was born. During our transition stage, all my dreams - including owning my dream dog - was put on hold. Once the girls had reached a responsible age, we decided as a family to get a dog. However, the dog that we ended up getting, is our matriarch, Abby. When my search again began for a Dane, I was constantly turned down by breeders, as I did not have any experience. 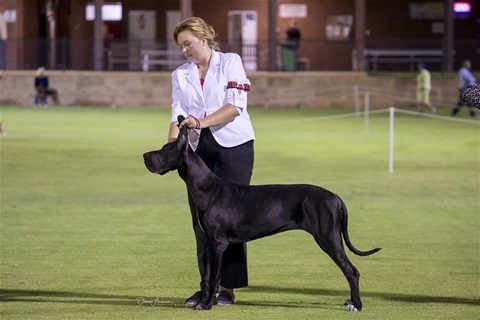 It was not until 5 years later, I got my first Dane, Sheba - whom Martyna got for me. Unfortunately, it has not been an easy ride with Sheba - after many private lessons, trainers, behaviourists, broken ribs and broken cysts, Sheba has finally settled, after being diagnosed with fear aggression. I blamed myself for Sheba turning out the way she did, so a year later I went and got her brother Boris, for my husband. However, Boris has been diagnosed with three different types of aggression (conflict, unpredicable and fear) - causing him to be put on medication to help him keep his emotions under control. From my experience with Sheba and Boris, I have learnt that breeding is not only about coat colour or health, but about temperment. I do not want anyone to have to go through the heartache and tough times that I had to go through with my two, but no matter the hardships, I love my two bubba fawns to bits. And now my story takes a different turn as we begin our breeding journey. Caroline with Cc & Maja. Hey! 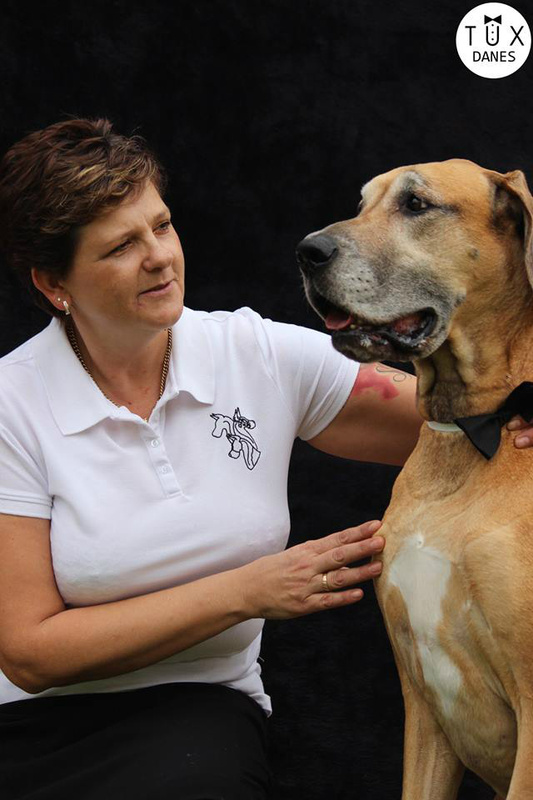 My name is Caroline Furst, I am the dog show handler and photographer/social media content creator for TUXDANES Great Danes. My love for Great Danes and dogs in general, began with the anticipated arrival of Cc and Maja. When they arrived I found myself becoming more intrested and more keen to get to know them and build a bond. I sucessfully did and now I am very honoured to have them as my fur-children. The best thing about being apart of TUXDANES is the pitter patter of little puppy feet when they are older and they run out for their breakfast/lunch and dinner. It's the most cutest stampeed ever. Hello! My name is Wesley Furst, I am the behind the scenes member of TUXDANES -I assist with how things are run and help out will all the behind the scenes. Boris is my fur-child and I have gone through a lot with him and his agression but I feel a bond that will be forever. My love of danes continued, I later became more fond of Cc & Mickey. Danes are like chips that you get hooked and can't get enough. The best thing about being apart of TuxDanes is seeing all the puppy updates and seeing how they grow and develop into stunning danes.